The UAE flag is about to go where it’s never gone before. 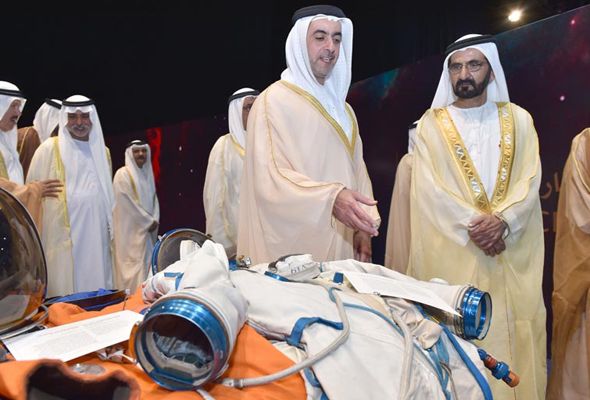 HH Sheikh Mohammed bin Rashid Al Maktoum, vice president of the UAE and ruler of Dubai, has officially launched the UAE’s first astronaut programme. The search is now on for four Emirati astronauts, who will be trained on various space missions with the aim of heading to the International Space Station within the next five years. “On this day, a new chapter in our history begins,” Sheikh Mohammed said. “The people of the UAE will break barriers, there is no power strong enough to stand in the way of those who believe nothing is impossible. Our ambitious goals are fueled by dedicated people, who support us until, without hesitation or skepticism, we succeed. Sheikh Mohammed invited young Emiratis to register for the programme through the Mohammed bin Rashid Space Centre. “The most competitive applicants will be selected to be ambassadors for the UAE in space exploration,” he said. Finalists will have to undergo training in theory and science, and complete specialty qualification courses over several months. The top students will be screened, and then four Emirati astronauts will be selected to form the UAE’s Astronaut Team. The chosen four will join the International Space Station on the UAE’s first ever space mission, to share knowledge and experience with other global astronauts. The Astronaut Programme is the first of its kind in a series of projects in the UAE dedicated to developing advanced sciences in order to empower future generations. This includes the possibility of inhabiting other planets. The UAE hopes to become a global leader in space exploration over the next 50 years.